There are so many choices for roofing in the market today that, if you don’t know precisely what it is you want, making a decision becomes all the more difficult. Natural materials like slate and wood continue to enjoy a popular following, although many homeowners consider products like shingles and metal as more reasonably priced and practical roofing choices today. To be sure, all of these are excellent choices that come in an ever-growing selection of types and styles to suit every homeowner. Each helps bring distinctive design elements to your home, but selecting your roofing material should not be done with only style in mind. Instead, you must carefully weigh the advantages and disadvantages to determine which will best fit your personality, character and needs. What is the material’s average lifespan? How will the material perform in the face of natural disasters, such as wildfires or hurricanes? Is my existing roof framing strong enough to support the material? Are the materials environmentally friendly and recyclable? Asphalt shingles. Asphalt shingles are used on over 80% of residential roofing systems. Why does this material remain the most popular choice on the market today? Material: Made of organic paper fiber mat or fiberglass, and covered with asphalt and a coating of mineral granules, this roof typically lasts 15 to 30 years. Fire & Wind: Good resistance against fire and fair wind resistance. Weight: Moderate in weight, it does not require heavy duty framing for support. Eco-Friendly: Petroleum-based product that’s not eco-friendly. Can be recycled, though it is often taken to landfills. Cost: Inexpensive to moderate. Prices range from $70 to $120 a square and will last 20 to 25 years. Metal. Metal roofing lasts longer and is more wind resistant than asphalt, but costs slightly more. Material: Comes in steel with a zinc coating or painted finish, aluminum, copper or zinc alloy. Copper roofs acquire a protective green patina with age. Fire & Wind: Resistance to both fire and wind is good. Eco-Friendly: Is usually made from recycled and recyclable materials. Absorbs a third less heat than asphalt. Cost: Moderate (steel) to expensive (copper). Prices start at around $100 to $300 a square, but some can cost $600 to $800 a square. Metal roofing can last 40 to 75 years. Slate. Brittle and expensive, slate is durable and is one of the oldest roofing materials. Weight: Heavy. Requires a reinforced roofing structure. Eco-Friendly: Made from natural material. Cost: Must be installed by trained workers. Prices start at about $600 a square and up. Can last 50 years to 100 years or more. Wood. Shingles and shakes are made from rot-resistant woods. Material: Commonly cedar, but can also be other rot-resistant wood, such as redwood. Fire & Wind: Good wind resistance. Poor fire resistance (but can be treated with a fire retardant). Cost: Moderate. Prices start at around $100 to $150 a square and will last around 25 to 30 years. 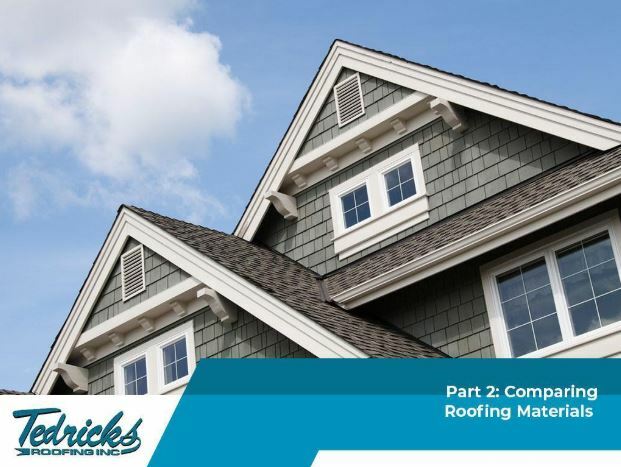 In the third and final part of this blog series, let’s discuss what characteristics make for a good roofer and why finding the best roofer for you is extremely important.